Celery | Become Healthy or Extinct! Celery is used very frequently as a base in juices and soups, just like cucumber, because it is alkaline and has a high water content. It contains good levels of Vitamin C that supports the immune system as well as improves cardiovascular health. Its Vitamin C also helps reduce colds, asthma and inflammation in the body by reversing the damaging effects of free radicals. Celery is called Ajmoda in Sanskrit, Shalari or Randhuni in Hindi, Bandhuri or Chanur in Gujarathi and Bodiajmoda in Malayalam. Celery contains plenty of potassium and sodium, which make it a diuretic that helps rid the body of excess fluids. It contains the active nutrient phthalides that has been shown to lower cholesterol. Phthalides also help relax the muscles around arteries, allowing them to dilate, thereby making it easier for blood to flow at a lower pressure. This is why Celery is used as a high blood pressure cure in Traditional Chinese Medicine. Celery also contains compounds called “Coumarins” that play an important role in preventing free radicals from damaging the cells of the body. Coumarins help decrease the mutations that cause certain cells to become cancerous. Coumarins also trigger the release of immune defenders that target and eliminate potentially harmful cancer cells. 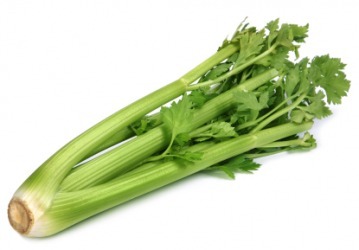 Another special ingredient in Celery called “Acetylenics” has also been shown to stop the growth of tumor cells. The best way of getting all the above nutrients of celery would be to have it raw in your salad or juice, after cleaning it properly of course. Using in a soup or cooked food does give you its wonderful flavor, but part of its nutrient content gets damaged. What is meant by Celery? Please tell us in common language. Hi Kumar, Celery looks like big Kothmir leaves, but its taste and strong fragrance is quite different. It is usually put in Chinese fried rice. I have put up a picture for clarity. Celery is called Ajmoda in Sanskrit, Shalari or Randhuni in Hindi, Bandhuri or Chanur in Gujarathi and Bodiajmoda in Malayalam.